A visit to the vets can be a very stressful event for all involved. 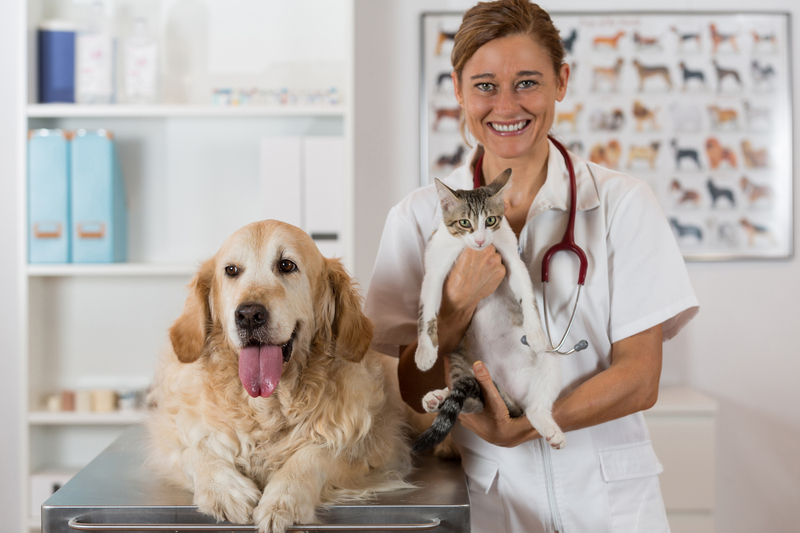 Many factors contribute to anxiety surrounding the vet visit. The car ride, the smells sights, and sounds, and not to mention the scary vet themselves! So how can we make the visit easier on our beloved pets? There are many things we can do in fact to ease anxiety on our pets. What are the signs of stress in my pet? Slow steps and positive experiences are the key to reducing anxiety in your pet. For many pets, the car ride is where it all begins and can be a scary place. Perth can get very hot, so ensure you utilize air conditioning in your car, or an open window to allow fresh air through. Introducing your dog to the car…..
Start with investigation of the car, allow them to enter the car on their own terms, sometimes treats or their favourite toy can be used to encourage them into the car. Once in the car, praise their very brave behaviour. Once comfortable entering the car, harness your dog, and move to the driver’s seat. If your dog remains calm, attempt a short drive. Once your pet is comfortable with car rides, attempt the vet visit. Keep the first visit short, allow your pet to investigate as little or as much as he/she would like. Praise your dog for more brave behaviour. If at any stage your pet is developing anxiety, end the visit. Avoid reassurance to a pet who is already showing anxiety signs. Instead remove them and allow them to calm, then reward calm behaviour. Desensitizing is the key to success; repeated exposure of the vet clinic is vital to break the phobia attached to it. Weekly weigh-ins are a great way to get your pet used to the vet clinic, and gives staff the chance to fuss over your dog, they may even get a sneaky treat for their courage! Introducing your cat to the car…..
Cats can be a little trickier, cats naturally like to retreat and hide if they sense fear or anxiety. Introduce the cat carrier to the cat in a visible comforting area, and allow them to investigate on their own terms. Place treats or toys near the carrier to encourage them to investigate. It may take days or even weeks for a cat to embrace the cat carrier. If they enter the cage, allow them free access to leave. After they are comfortable, attempt to close the door. Once your cat is comfortably in the carrier, move him/her to the car. Turn on the car, allow your cat time in the running car, but do not leave. Gradually build confidence in your cat for a very short trip around the block. Some cats like to hide, so providing a nice blanket that smells like home can ease the stress. Reassure them of your presence and praise them. Next step is the clinic. On arrival at the clinic, try to position yourself in a quiet location. A cat generally copes with anxiety by running and hiding, usually somewhere high, so naturally a cat in an enclosed carrier will have a degree of anxiety we cannot elude. Placing your cat in a high location may help them feel safer, try to avoid putting them on the floor. What else can we do about pet anxiety and fear? Feliway is a replication of the pheromone cats leave naturally when they are feeling comfortable in their environment, just think about all those times your cat rubs against your leg or nudges the door, it is leaving behind pheromones. Feliway can be sprayed into your cat carrier to help ease the stress of the vet visit. Like Feliway, Adaptil mimics the pheromones a mother dog emits to her puppies following birth, this aids to confirm and affirms the attachment mum and pup. The pheromone can still have the same calming effect on adult dogs in stressful situations. Smells from home are also very reassuring to a scared pet if their favourite blanket or teddy can come for the trip why not bring it along too? Vet prescribed medication is also available. If you would like to discuss these options book an appointment with your vet. The above products are available for purchase at Vet24. Our vets are also available for consultation to discuss your pet’s anxiety. To book an appointment please click here.